It's the no-compromise audio interconnect for no-holds-barred performance. Solid silver conductors and patent pending Dielectric-Bias System make Audioquest Sky the perfect choice for perfectionists. Sky boasts AudioQuest's acclaimed DBS system with a 72-volt battery, plus dielectric featuring 50-percent larger FEP Fluoropolymer air tubes than premium Cheetah cable. The effect of dielectric (or insulation) on cable performance is universally acknowledged. No insulation, other than a vacuum, is perfect. All insulation conducts some tiny degree of electricity in the presence of an electrical field, and this effect can cause distortion and signal loss. The grossest errors caused by "dielectric involvement" occur when the dielectric hasn't been given sufficient time and voltage to stabilize. 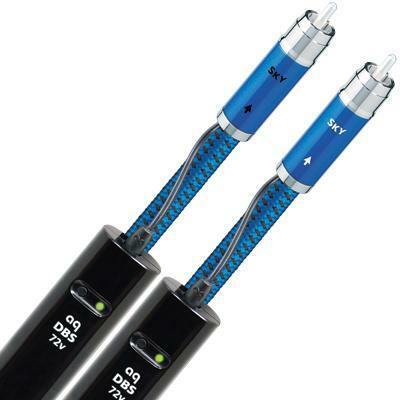 Breaking in a cable simply means allowing time for a cable's dielectric material to adapt to a charged state. But what if a charge were present from the very beginning of a cable's life, allowing the dielectric to maintain a 'stable' state? AudioQuest's patent pending Dielectric-Bias System (DBS) puts all of a cable's dielectric into a comparatively high-voltage DC field beginning at the moment that the cable is terminated. This exceptionally simple design puts a wire down the middle of the cable, which is merely an extension of a battery's anode. In other words, this wire is attached to the positive terminal of the DBS battery pack and not to anything else. The wire is not in the signal path and has no interaction with the signal. The shield or outer spiral of conductors is used as the DBS cathode by connecting it to the negative terminal of the battery pack. Again, there is no interaction with signal flow and no extra connections are introduced into the signal path. The batteries are doing no work. They will last as long as the batteries sitting on your storage shelf, so you will very seldom need to change batteries. To check battery status, the DBS pack includes a button and LED. The benefit of maintaining a constant bias on the dielectric is dramatic. Even a cable which is fully 'broken in' or which has the loudest music or pink noise continually traveling through it never has a fully formed dielectric compared to what the AudioQuest Dielectric-Bias System achieves. In fact, imagine an improvement of double or triple that of a normal 'broken in' cable, and you begin to get an idea of what AudioQuest's Bill Low says can be achieved with the DBS system. Sky uses 19 awg PSS solid conductors. The solid conductors help prevent strand interaction, which can be a major source of cable distortion. Sky's extremely high-purity Perfect-Surface Silver (PSS) minimizes distortion caused by grain boundaries, which exist within any metal conductor. PSS nearly eliminates harshness and greatly increases clarity compared to OFHC, OCC, 8N and other coppers. Sky's three 19 awg conductors are arrayed in a "Triple Balanced" design. This design insures that the positive and negative signals have equally low distortion conducting paths. The 100% coverage shield helps keep RFI and EMI out of the signal path and is never used as an inferior audio conductor. The FEP Fluoropolymer Air-Tube insulation used in Sky places almost nothing but air around the conductors. Welded plugs complete Sky's design. 8,000 amps are used to weld RCA plugs to Sky, creating a perfect connection alloy where the cable and plug meet. A thick direct-silver plating provides the best possible connection.